It's time for another round of Get The Look. 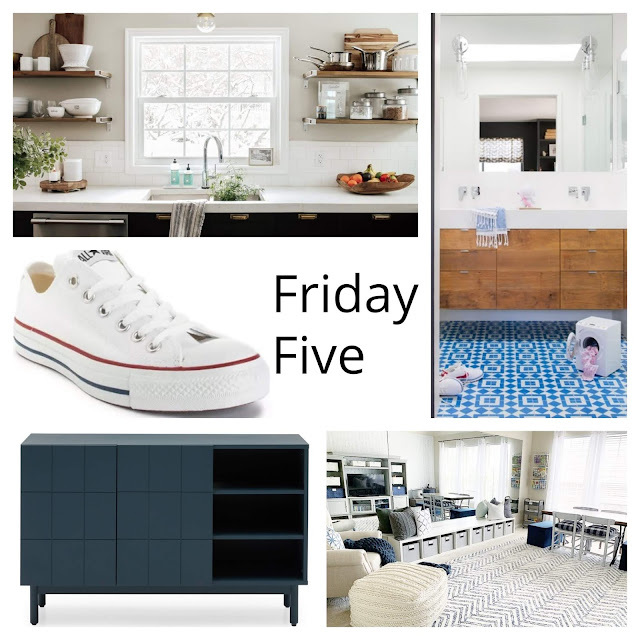 In this series I get to share with you a beautiful space and give you pieces that you could use to re-create it for yourself. Most often, cheaper versions than the original space. This sunny sunroom caught my eye because of the colorful rug and bright and happy sofa. The rug has a lot of pink which I don't get to use much of in my own home. I love how there is so much color but balances out with the white walls as the base. This rug is one I've had my eye on for a while. The blues and pinks are a match made in heaven. This would be a great room for an office or to get away read a book. Here is my take on this light and bright room. A crazy week of getting back into the swing of things after vacation. Why is it always so hard to go back to work? School projects are coming up and Milestone testing starts next week for my fifth grader. My kindergartner has no clue how easy he has it right now. Anyway, here's my weekly recap of goodness that caught my eye. 1) I love this re-purposed thrift store art from Savvy Apron. I've been looking for art for the dining room and this may be the solution. 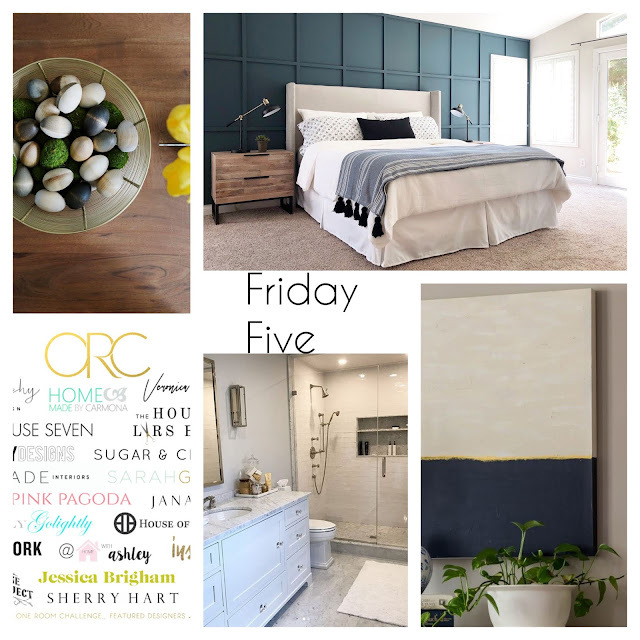 2) I love this dark blue board and batten wall from Angela Rose Home. 3) I don't typically decorate for Easter but love this simple DIY to dye wooden eggs from Chris Loves Julia. 4) The One Room Challenge spring edition has started! I love seeing the process of each project. There is even a linkup for guest participants. Maybe I'll join next time! I love the look of real plants but I don't know about you, this girl is good at killing them. I've had a fiddle and a couple of yucca plants and they are sadly no longer with us. It's not that I don't want them to survive, I just forget to water them or over water them. I think the yuccas lived the longest. Once the weather gets cold it's hard to keep them warm and happy. House plants are good for purifying the air in your home. They help remove invisible toxins that are unhealthy for us like carbon monoxide. Did you know what some of the products in our home like furniture and air fresheners release formaldehyde? Plants also help reduce stress and fatigue. 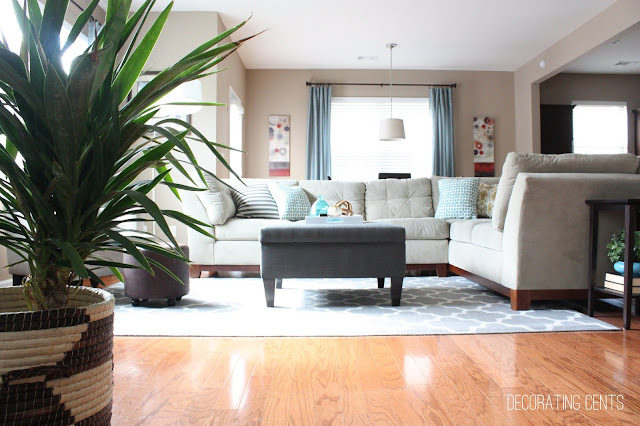 Plants not only bring life to a room but they also look good. Put them in a pretty basket and you have yourself some instant decor. Not too mention the pop of green looks good in any room. Welcome to spring! Nothing like warmer temps and pollen covered cars. As much as I want to dine on the patio for lunch, I know it'll put me in a sneezing fit. And my kids are already sniffing and coughing. You can keep that part of the season! Just give me the go for flip flops. 1) Have you seen the new MoDRN line from Walmart? The pieces are so on point but items are a little pricier than what you'd expect from them. I'm really loving this cabinet. The color is so pretty. 2) Have you ever wanted to take a picture of a room with a window but it looks blown out? This tutorial explains how to keep everything in the picture bright all while still being able to see everything outside of the window. A real game changer. 3) Bethany's playroom reveal is so good. I love the blues and the different stations she has set up around the room. Now if I could just get my kids' space together. 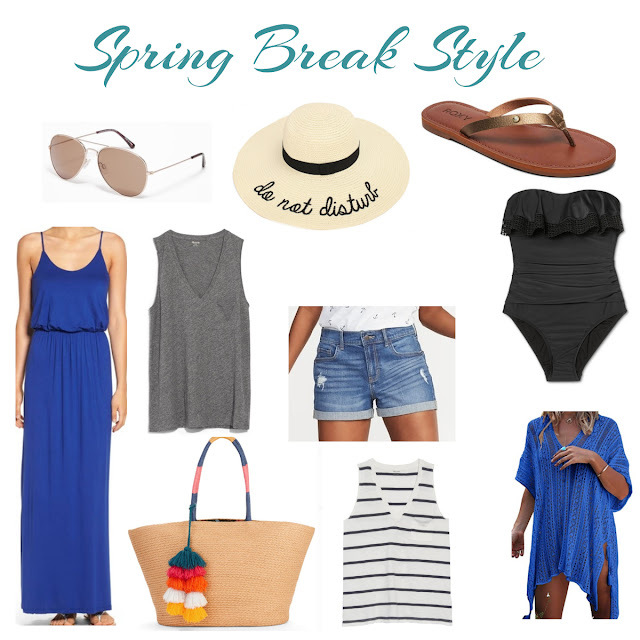 Spring break is just two weeks away for us. We haven't told the kids so it'll be a total surprise for them. We are cruising again. We weren't looking to take a cruise again for a while but came across a good deal we couldn't pass up. The kids are avid Youtube video watchers and were watching videos of cruises before we made a decision. It's like they were in our heads. They are still watching them and my daughter even made the comment, well, if we don't take a cruise this year, I'll be happy with a family road trip. What!?! These kids. Where is the money they are willing to contribute to said trip? It's up to me to make sure everyone has what they need for the trip. Including new clothes for both kids. Why do they insist on growing up and getting bigger? They both grew out of last year's clothes. Ugh. I don't know about you but with spring on the way, I am all kinds of ready for sandals and taking these layers off. 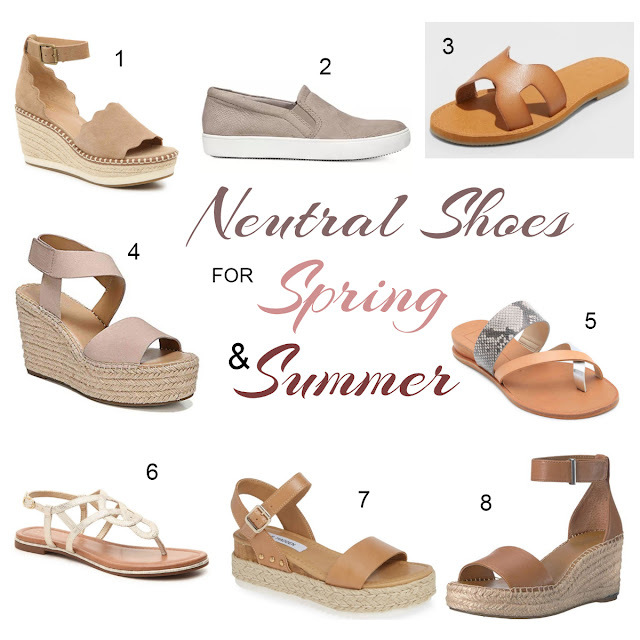 The warmer months are when I gravitate towards neutral shoes. They are so versatile and go with every outfit. I usually go for a cognac or dark tan since my skin is a darker tone. Yes, I still wear black sandals but not as often. I'm a huge wedge person. They are usually more sturdy than heels and more comfortable. If I can find a comfy heel though, I will grab it. Before every season I like to go through my closet and get rid of shoes that I am tired of or didn't wear the year before. I have gotten pretty good at selling my old stuff on Ebay or Poshmark. It helps me keep my out of pocket expenses at a minimum. Here are some shoes I own or have my eye on for the new season. I love the hunt for a good deal. I knew for our breakfast nook I wanted a modern look and something that would clean easily. 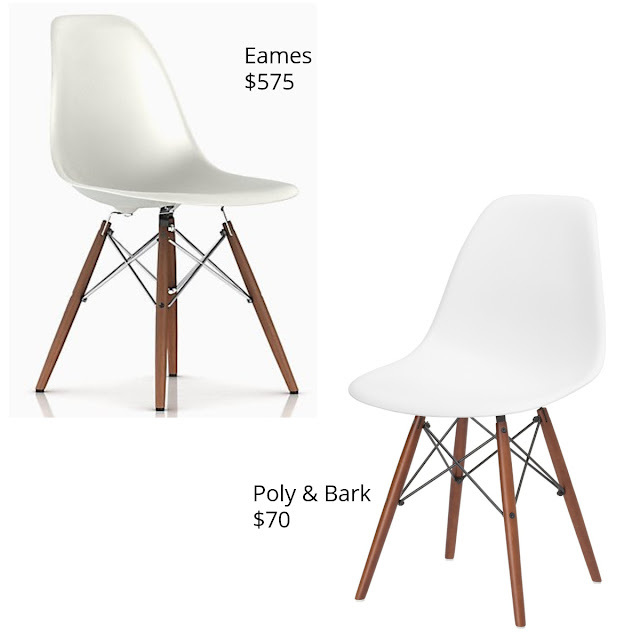 The Eames style chair was at the top of my list. Of course I couldn't afford the $500 price tag, especially since I needed four of them for my space. I started the hunt online. There are tons of retailers online that sell replicas. I found that Poly & Bark sold one that had great reviews. Their price was also better than the original style of chairs. They also offered a version with darker walnut legs. This was a bonus for me because I liked this color better than the natural. I ended up going with this chair but I found a set of four on Amazon for a cheaper price. Amazon actually had a ton of alternative brands too. Remember, always do your research before making a purchase. There's bound to be a better deal.